With more people cycling to work in cities such as London, New York, and San Francisco, the conversation often turns to the dangers of riding in heavy city traffic. I mentioned that I had just walked from Hackney in east London to the City and was surprised at the number of cyclists in the latest reflective and polypropylene cycling gear who were nonetheless weaving in and out of traffic without a helmet. My lawyer friend laughed knowingly. “I keep a photo on my phone of my cracked helmet to show people what their head might look like when they cycle without one,” he said. Boris Johnson, the mayor of London, has often sung the praises of cycling to work, and the rental bicycles scattered through the city are even nicknamed “Boris bikes” because of his support for them. But even though Mr Johnson has had a few close calls while cycling, he has refrained from making bicycle helmets mandatory. 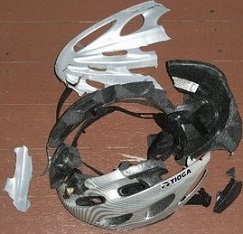 I understand that riding in hot weather with a helmet can be uncomfortable, but I think the case for helmets, mandatory or not, is hard to dispute. Australia, New Zealand and parts of Canada have adopted compulsory helmet laws and it is clear that cycling deaths declined in the years after those laws were adopted. Some have pointed out that the number of heart attacks rose in Australia because some cyclists gave up riding to work rather than wear a helmet, but is that really relevant? The grim fact is that London had already reached eight cycling deaths by June of this year and New York recorded a doubling of fatalities from nine to 18 in 2014. It is true that the number of cyclists is increasing in both cities, which is a good thing, but that does not diminish the avoidable dangers. The victims included a prominent Manhattan surgeon and a neuroscientist, who were not wearing helmets. Michael Carter, a paediatric neurosurgeon in Bristol, told me recently that he often sees cases of head injuries from bicycle accidents in his hospital’s emergency room that could have been avoided if the cyclists had worn helmets. “It makes no sense whatsoever to ride without a helmet,” said Dr Carter, who has stopped cycling in the city because of the recent deaths of two friends. The Cochrane Library, widely accepted as the gold standard for medical research worldwide, looked at bicycle accidents and did a statistical comparison of different studies to see if there were patterns in helmet use. One solution to the problem of bicycle safety is the creation of dedicated bike lanes, which has happened in Berlin, New York and other cities and should be tried elsewhere. But they do not eliminate the danger entirely and the reasonable response is to wear a helmet, even for short rides. If the above doesn’t convince you to wear a helmet- also consider that medical insurance payouts are halved if the cyclist wasn’t wearing a helmet.